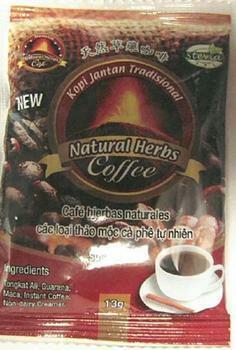 Brian Richardson dba “In Tha Pink,” is recalling ground Kopi Jantan Tradisional Natural Herbs Coffee, which is marketed as a dietary supplement for sexual enhancement. FDA analysis has found the product to be tainted with sildenafil and tadalafil, approved drugs for the treatment of male erectile dysfunction. The presence of these undeclared active ingredients makes the product an unapproved drug for which safety and efficacy has not been established. The product, which comes in individual 13 gram packages, UPC 9 557205 06008 3 with an expiration date of October 13, 2020 (13/10/2020) stamped on the back of the package, was sold nationwide by online retail sites -- including but not limited to -- Ebay and through mail orders, since September, 2017. The firm is notifying its customers by mail and arranging for return of all recalled product. Customers who purchased the recalled product should stop using and return it to “In Tha Pink” for a full refund. Consumers with questions regarding the recall may contact “In Tha Pink” at (214) 803-4652, Monday through Friday, 9 a.m. to 4 p.m. (CDT.